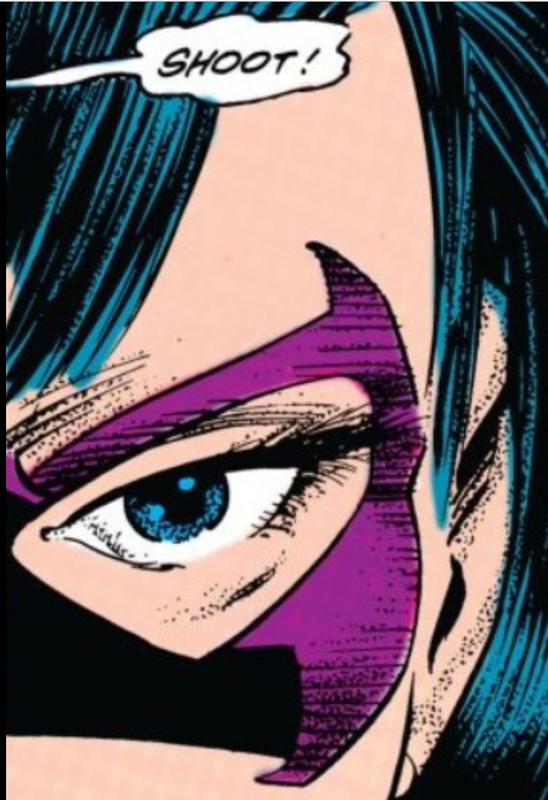 In The Huntress #1, Joe Cavaleiri gave us a crash course of what we needed to know about this new Huntress, Helena Bertinelli, oppose to the pre-crisis one, Helena Wayne. Actually, from my vantage point, because I read issue one after the fact, to put it mildly, the debut issue comes off as a crash course, but actually, I have to say, for someone who was reading the book in real time, issue one is rather action packed. In issue two which is entitled, "Uneasy Lies the Head...", a reference to Shakespeare's King Henry IV part two, we get a cast of characters who are well rounded based on actions and dialogue. The landscape written by Cavalieri not only feels real and immediate, but with the multiple players that he plays with in this issue, as a reader, I didn't mind Huntress not being on every page at all. Let us go back to the late 80's early 90's, where the crack epidemic ripped a hole through many major cities in the United States. I grew up in a big city where I witnessed how crack affected the community and the effects of the drug on the community. Again, this book goes straight for the jugular. As you can see this neighborhood has the banner: Drug Dealers Get Out. Joey Cavalieri had his pen on the pulse with the subject matter. And the drug "crack" is actually mentioned in this story. Creators always have to be careful when covering something so real like this, especially if the creative team doesn't really have a background or a close connection to it. Many people in the United States did not use crack; however, there are many who knew a relative, co-worker, or friend whose life was affected by the drug and the lifestyle that come with it. 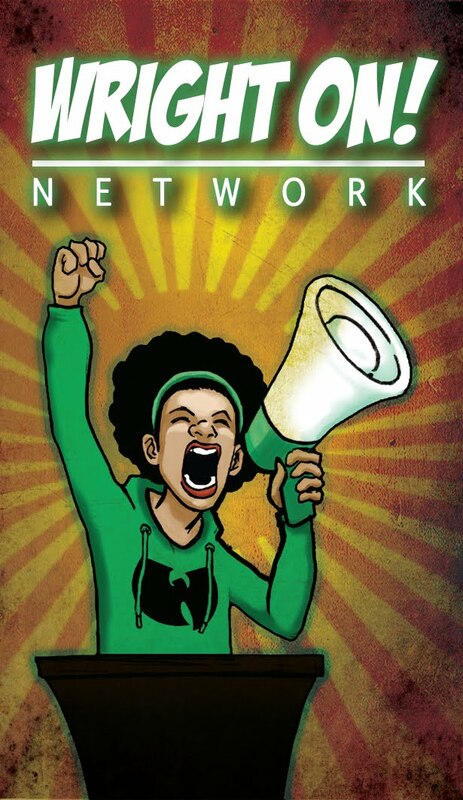 Many of you who are old enough to remember (and many who are not, but ride with me) when mainstream America tried to accept Hip-Hop culture, the art form would usually be displayed in the most cringe worthy way imaginable. But in this book, the mob, the drugs, and everything in between and the outskirts of do not feel offensive or problematic at all. I could be wrong. Thus far in this Huntress book, the focus is placed on those who are profiting and supplying the drug to the streets, instead of criticizing those who succumb victim to the vice. In the image above, we see the Huntress being the folk hero, running out a street punk from the block in front of a mother and a daughter, who not only feel empowered by seeing that there is someone who cares about the every day person, but maybe even more so by the fact that the vigilante who intervened in the day to day struggle was a woman, capable, strong, and fearless. With the Bertinelli family wiped out of existence as far as the mafia game is concerned, you have other tribes who want to fill the void. One group that wants to incorporate the Wal-Mart model, by being the warehouse, the delivery service, and the seller, are the Colombian gang, who are not named, so I have to refer the them as the Colombian gang right now, thinking they can fill the void of the King of New York. When the Huntress busts in on their little set up, she really gives them a scare. She wants answers, but the only thing she can get out of these not ready for prime time crooks is their only plan - take out Tony the Gut, an Italian gang leader who assumed next in command after the Bertinelli gang were exterminated. I didn't mentioned anything about Helena's costume in the first blog post. To be honest, I'm not over the moon about it, but I must say, whenever you get a close up of Helena in any incarnation of the character or costume, she has this "draw you in" intimidating factor, which I adore. In this close up of Huntress, she looks great, but the costume as a whole is not very tactical and practical as my friend Mark would say. The cast of characters in this one are somewhat familiar but necessary for our protagonist. Sal, the red head curly guy who was Helena's bodyguard turned trainer, plays the role of her confidant - almost like an Alfred if you will. And I hope that you do. Then there are two cops, O'Shea and Fiorello, who are written with some good dialogue, considering the space they had to operate. 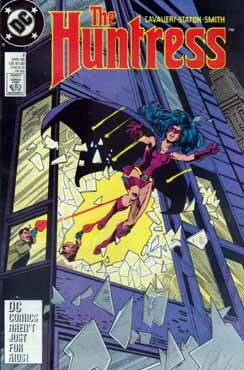 Fiorello comes off as older, cynical, and seeming to have an ulterior motive against Huntress. O'Shea appears younger, optimistic, hinting at a future partnership with Huntress, a Commissioner Gordon insider type thing. Both cops are written as if they are from the "old neighborhood", who became police officers on the streets they ran as a children. The baddies, like the Colombian suppliers, Tony the Gut's crew, and an interesting character introduced in this book, Mandragora who is described as being old school. Mandragora, or the demon, is an interesting character operating outside the realm of our Huntress Universe. Based on what we see from issue 2, it is as if he appears out of no where, not really present during the Bertinelli run. Tony the Gut, who thought he had it made in the shade, is intimidated by Mandragora and his shadowed, masked, gun holding friend in the background. Mandragora, who quotes Shakespeare at will, explains that the mob in America isn't holding up the edicts of what the mob was originally set up for, which is to safeguard the people against outside influences, protection, greedy politicians, overbearing taxmen, and giving refuge to people who can't find work because of their nationality. Could Madragor be of the supernatural? We shall see. The story concludes with a boom-pow action scene with most of our major players. Our two cops, O'Shea and Fiorello are there to stop criminal activity, potential or otherwise, Fat Tony and company are present to celebrate their assumed ascension after the death of the Bertinelli family, and members of the Colombian mob are in attendance as well. Crossfire, mayhem, and Fat Tony sneaking out ensues. After the smoke is clear, officer Fiorello was shot by a Colombian gang member who didn't realize he was a cop. Huntress takes the lot of them out, not fatally, of course. 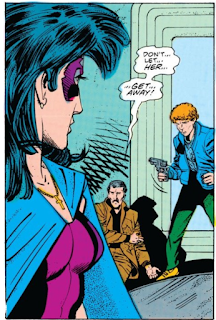 Fiorello, not thinking Huntress is a vigilante for the side of the Angels, instructs O'Shea to shoot Huntress point blank. 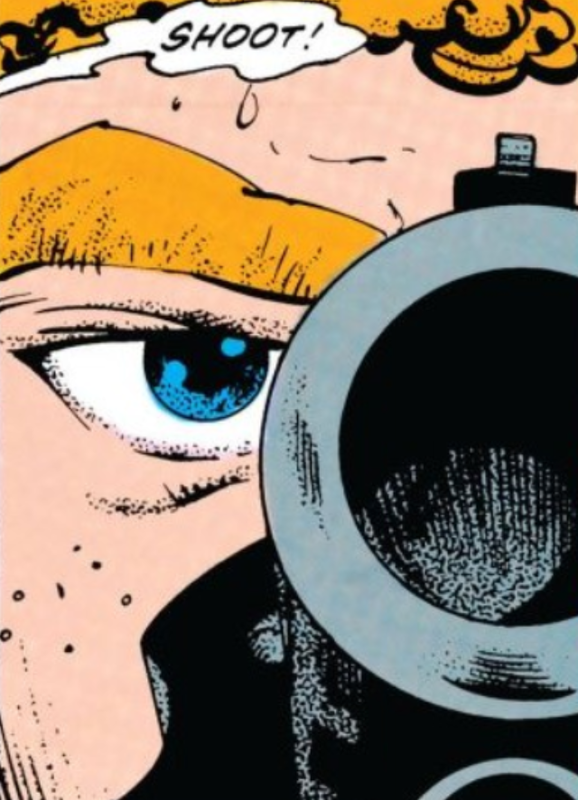 After a long stare down between O'Shea and the Huntress, knowing in his heart of hearts, O'Shea declines from shooting a person who he deems as not being a threat. I can see a partnership forging here.